Maternal instinct outrides everything but what lengths would you go to to get a baby of your own. Ten years ago something terrible happened in both Nick and Kat's lives but neither of them speak about it. Happily married and desperate for a baby to complete there family, they decide to adopt from another country. When two seperate adoptions fall though it seems all hope is lost that is until a blast from Kat's past comes back into her life. Lisa and Kat were best friends in high school and Kat even dated Lisa's twin brother Jake, but something terrible happened. Has Lisa come back to cause trouble or is she genuinly trying to help Kat and Nicks dreams of having a baby come true. Can everyones past secrets stay hidden? I got this book from NetGallley in exchange for an honest review. When I first read the synopsis for this book I was excited as I thought it sounded really interesting and really good. This book is a slow starter but it is worth sticking with it as once it gets started it is a great read, with a good plot, easy to follow, fantastic characters and amazing twists you don't see coming. 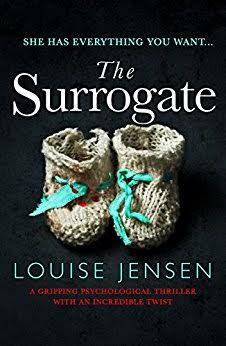 I really enjoyed this book I have never read any of Louise Jensen's books before, I shall be looking into her other books as I enjoyed this one so much. I have chosen to give this book four out of five stars as I will definatly be recomending it especially to my book club. This book has also made its way into my favorites category on my kindle.